I admit I’m a little bit of a child at heart and I’m not ashamed to tell you that I have my Disney DVDs lined up on display in my living room. After the lovely Genevieve’s post about the “grown up” magic wand this week I felt I had to share this with you, after all we all like Hello Kitty and that’s a cartoon. 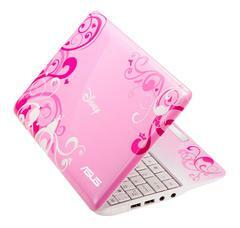 Disney has teamed up with Asus to give us technology and cartoon loving girls a netbook, which I can only describe as a dream come true. Admittedly, the Disney Netbook is aimed more at the younger market. It’s said to be web-safe and easy to use and is also durable, with a reinforced mechanical design. However, I’m not accepting that this feature is only for children, after all we all drop our tech products don’t we? It will be available from October in two models for a suggested retail price of £299. I’m hoping to review one of these and compare it to another netbook on the market to show you the differences so watch this space.